The Microraptor (MIKE-row-rap-tor) is one of the creatures in ARK: Survival Evolved. Aggressive towards anything regardless of size, Microraptor fancies itself an apex predator. It will attack humans on sight, especially if it's not alone. When hunting, Microraptor's speed is only one of its assets. While not quite capable of sustained flight, its wings allow it to stay aloft for several seconds while jumping. This allows Microraptor to attack its prey's vulnerable areas, as well as search for small river fish. Notable, the creature also tends to use this ability to knock oblivious humans off of their mounts. While not a powerhouse against armed enemies, Microraptor is particularly suited to dismounting enemy riders. Microraptors natural tendency to attack weaker creatures means they can ignore the mount while attacking the rider with leaps of fury. In spite of the dossier's statement of the Microraptor being an aggressive hunter, this is only partially true. 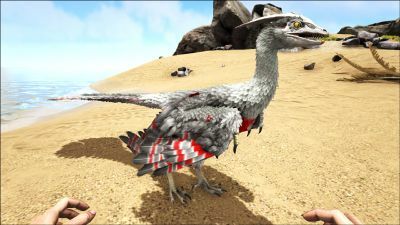 The Microraptor will attack a survivor that comes close, but only stuns them briefly before fleeing, without doing much damage to the survivor. They seem more skittish and timid rather than truly predatory. Microraptor is a small carnivorous dinosaur strongly resembling a bird with a reptilian face. The large feathers on their limbs act as primitive wings, allowing them to glide for short distances in pursuit of arboreal prey or to attack mounted riders. This section displays the Microraptor's natural colors and regions. For demonstration, the regions below are colored red over an albino Microraptor. 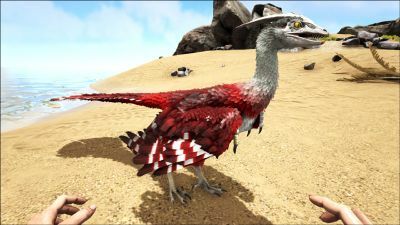 The colored squares shown underneath each region's description are the colors that the Microraptor will randomly spawn with to provide an overall range of its natural color scheme. Hover your cursor over a color to display its name and ID. For example, "cheat SetTargetDinoColor 0 6" would color the Microraptor's "body" magenta. It appears that Microraptors receive pack boost, just like the Compy and Troodon. The Microraptor employs hit and run tactics if you get too close. They will not attempt to kill you, but only stun you then sprint away. The Micro's strategy is to knock you off your mount and kill you while you are immobilized. Once it has done so it will then flee to escape the bloodthirsty beast you took on your journey. After this it will attempt to kill you once more while you try to get your stuff back. However, if a Micro is in a group this does not occur as they get a pack bonus and will not run away. Evidently, these creatures are not strong. They are easily killed once trapped in a bola or bear trap with almost any weapon. However, they can attack by surprise (they most often will) and if in a group the stun can be reset as soon as it is about to end. It is, for certain, one of the most annoying creatures in the game as it can leave you exposed to other predators, and is impossible to prepare for. Can be easily killed with almost any weapon if trapped in a bola or bear trap. While the Microraptor itself usually does not pose any true threat, its ability to knock riders off their mounts and immobilize them can allow more aggressive dinos to finish you off. However the Micro can be particularly dangerous to riders who have just been badly hurt in a fight and are close to death or are low level, as the Micro can kill them easily while they're immobilized and unable to defend themselves. There are two simple ways to kill a Microraptor, due to their speed and agility, chasing them will not reap good results, and may land you in front of a hungry Rex. Instead, it is recommended you use a bola on the Micro and take it down while it is immobilized. The other method relates to being attacked while riding a mount, the best thing to do in this situation is to get off your mount and allow your pet to destroy the little feathered fiend. It is also best if you whistle neutral to your mount after getting off it to avoid it not doing anything, and simply watching while you are being attacked. If you happen to encounter one of these little guys in the wild and wish to tame it, Stand far enough away to be safe, Hit it with a bola, Then just pelt it until it gets knocked out. Note that while bola'd, the Microraptor will still make small, weak lunges at you. Bodyguard: In PvP servers, the microraptor is incredibly useful in a battle due to its ability to hit players off their mounts and stun them. Just whistle attack and it'll be sure to open an opponent to gunfire! Meat Gatherer: Whenever a Microraptor is perched on your shoulder, it'll gather meat autonomously, saving the need for tools or another tamed dino. Caving Buddy: Though not as good in wide cave openings as a Dimorphodon, its expert hit-and-run tactics may provide a distraction that will open cave creatures to other means of attack. Thanks to 200% speed taming bonus the Microraptor is one of the fastest tamed ground creature in the game, which can easily outrun even the Gallimimus. Though not as good as a shoulder-mounted fighter as the Dimorphodon it still can be helpful for hunting skittish herbivores like Parasaur and Phiomia. Dossier released July 20, 2015. The Microraptor was one of the first dinosaurs found with feathers. In real life, it is believed to have eaten insects and small lizards rather than larger animals. Despite being listed in the dossier as a carnivore, its two favorite foods are Rare Flowers and Rare Mushrooms. The skull that is attributed to Microraptor in the dossier actually belongs to the famous Velociraptor and it is nearly identical in appearance to this picture of a Velociraptor skull. In game the Microraptor can sprint at high speeds. It actually could not sprint in real life. It shares it's sound with the Archaeopteryx. The Microraptor probably the second fastest dino in the game, the fastest being the Managarmr. This page was last edited on 19 April 2019, at 08:26.